Behind her, yellow police tape with the words "SHERIFF'S LINE DO NOT CROSS" flapped in the wind, indicating the scene of the crime. In fact, the police tape was tied to ABC News' own equipment just off-camera, a photograph obtained by CNNMoney shows. 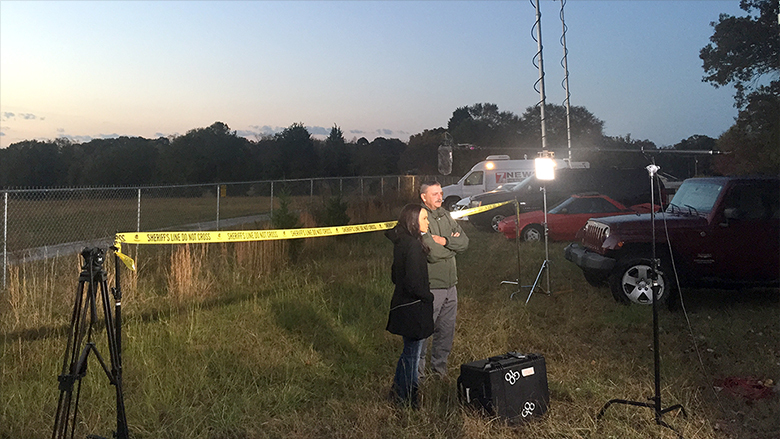 Sources with knowledge of the matter say the tape was placed there by ABC News for the purpose of its inclusion in the live shot. The photograph, sent by an anonymous source, shows the tape running no more than 30 feet and tied to camera stands at both sides. In Davis' segment, which was broadcast on ABC's "Good Morning America," it is impossible to tell where the tape ends. "This action is completely unacceptable and fails to meet the standards of ABC News," Julie Townsend, the vice president of communications at ABC News, told CNNMoney. "As soon as it was brought to our attention, we decided to take the producer out of the field, and we're investigating further." This is not the first time ABC News has doctored a shot. In April, ABC News producer David Fazekas created a fake reservation list for a segment about a restaurant in upstate New York that was thought to be among the most exclusive in the world. Fazekas later told The New Yorker that the chef "wouldn't let us see his actual list, so I wrote it myself—like a reenactment in a documentary." "There are services on the Internet that generate fake names," Fazekas said.